Knee Cap (with Rigid Hinge) a versatile device which offers the advantage of compression around the knee and the support of a side splint, while allowing normal flexion of knee. Tynor Knee Cap with Rigid Hinge (D 06) supports the knee joint and its adjoining structures. 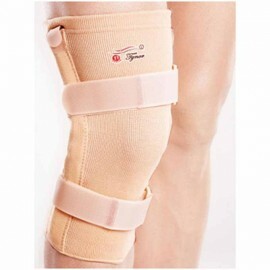 The splint supports the side structures of the knee and ensures to hold it in position. The splint is made up of two layers of nylon, strapped by rigid hinges. The knee is free to perform any movement and there is no constriction of blood. This splint can be used for knee sprains or ligament tears where the ligaments are incapable of providing complete support. Extra strap for secure fitting. Side splinting with free flexion movement. Double layered and four way stretch fabric. Hinge, mimics the motion of natural knee joint. Ensures thermophilic interphone with the skin. No constriction to blood flow, on one hand. Better grip to the body on the other.